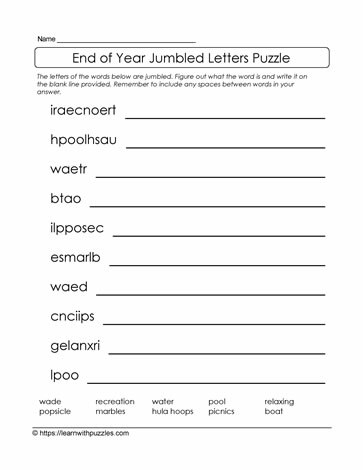 This jumbled letters puzzle is sure to keep kids engaged while the end of the school year winds down. Have them work with their peers to solve the puzzle. Start by brainstorming ideas of words that are associated end of year and some summer activities. Compare these words with the letter patterns and word structures they are familiar with, to start solving the puzzle.